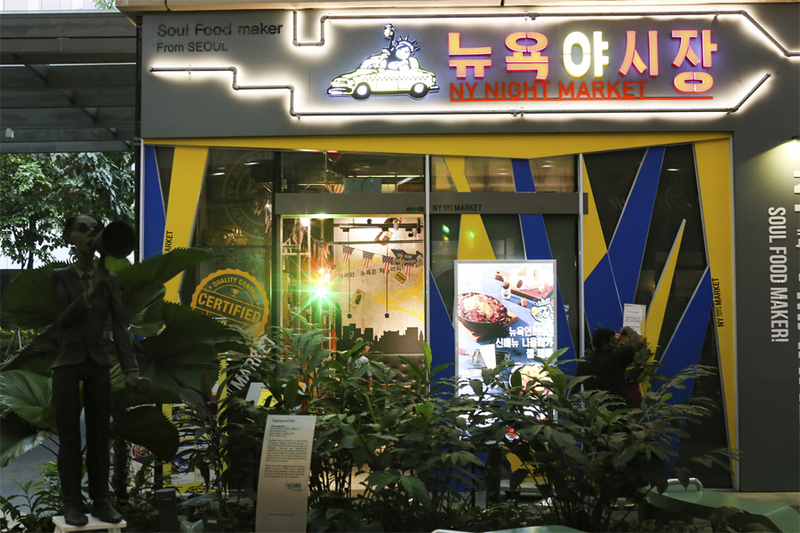 The popular NY Night Market 뉴욕야시장 from Seoul has opened in Singapore at Westgate shopping mall. 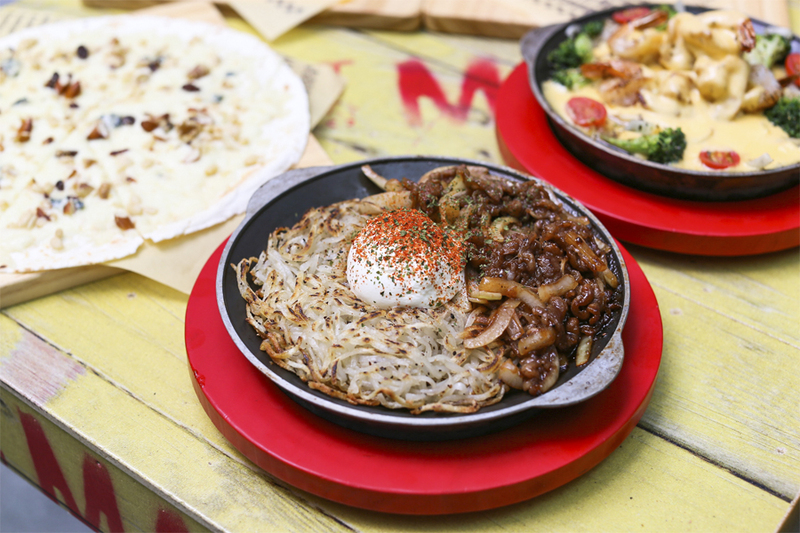 While it is called a “Night Market”, the Korean fusion restaurant inspired by the cosmopolitan food markets in NYC is opened by day time at 11am. Wait a minute. 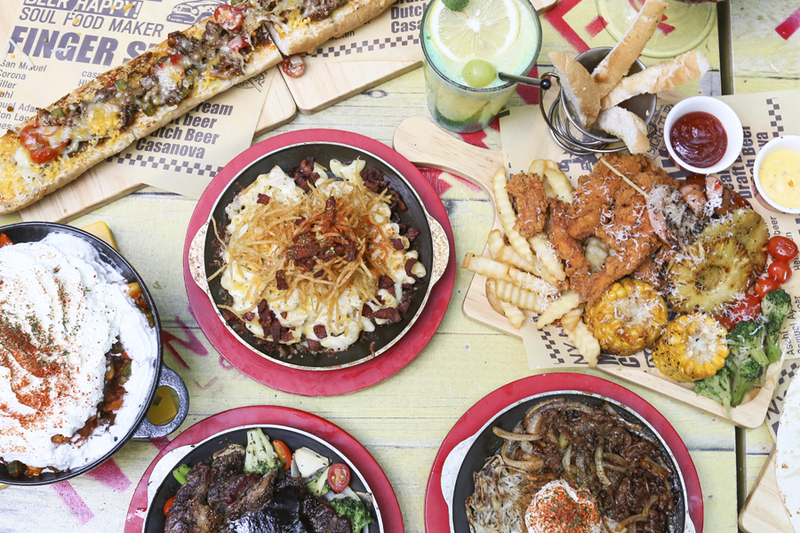 Before you get too confused, the restaurant specialises in international street foods that you can find in NEW YORK CITY. 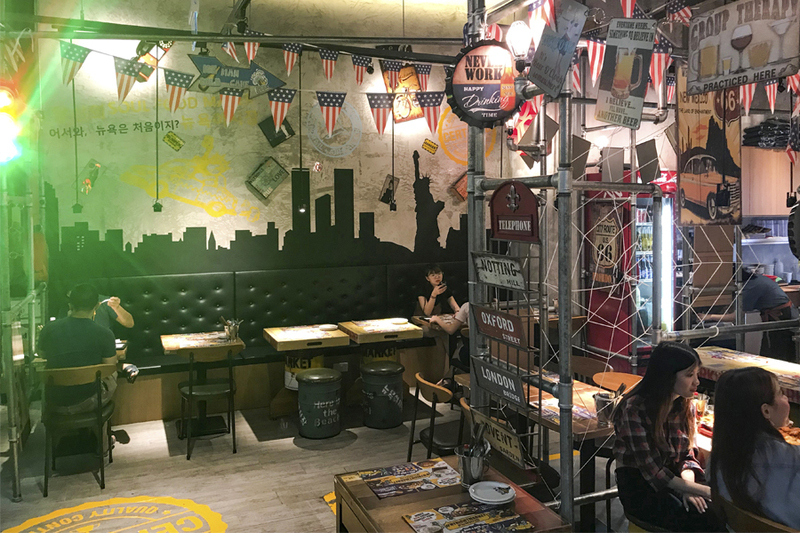 Nevertheless, the chain was first established in SEOUL Korea, though it is better known as “New York Yasijang” over there. There are over a hundred stores and growing. 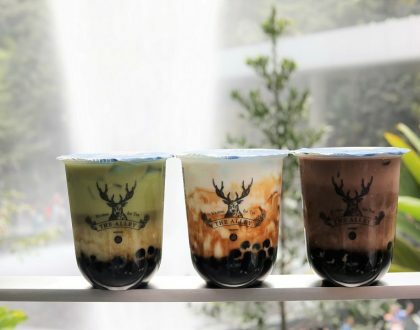 This is the brand’s first venture in SINGAPORE, located in the corner unit in the cluster of eateries on the first floor of Westgate. 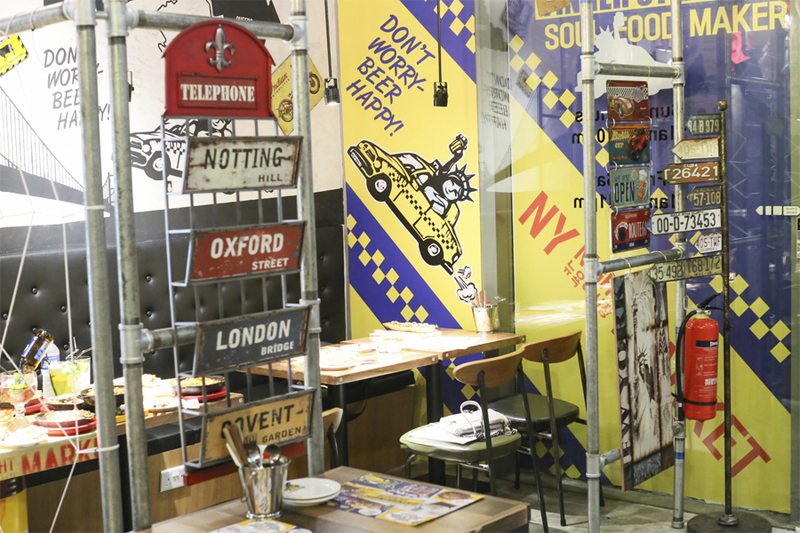 The interior screams OTT – USA flags strung above, a silhouette of New York City’s skyline at the back, neon signboards, miniature version of the LOVE pop art sculpture, and several other features representative of the Big Apple. 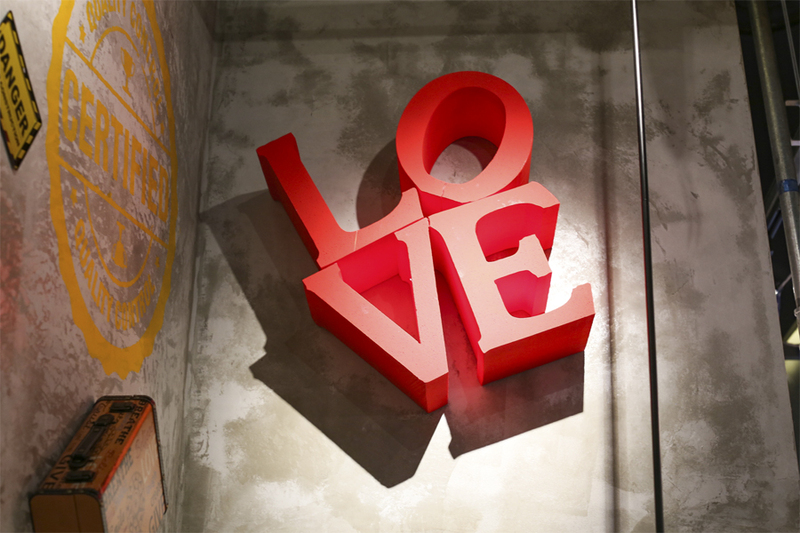 The chill and laidback ambience makes it an ideal hangout for friends and colleagues after work. 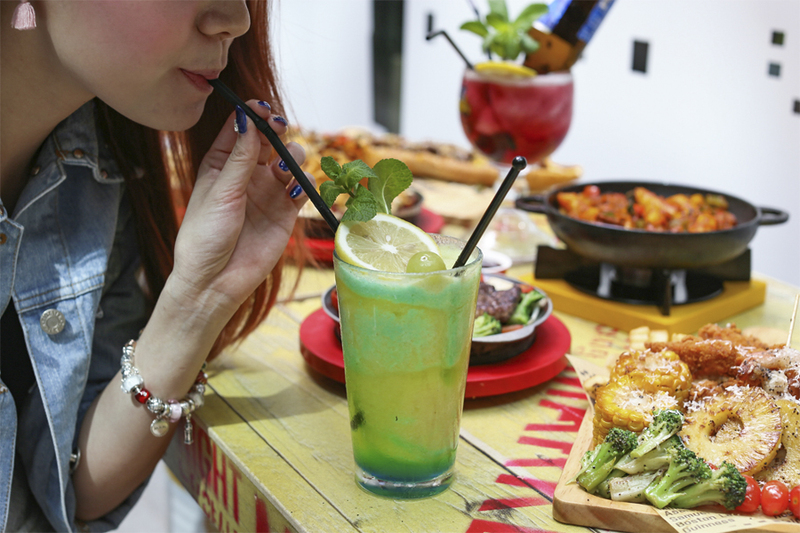 You can say it is like a bistro-bar, but yet with that pop-fun and colourful elements. 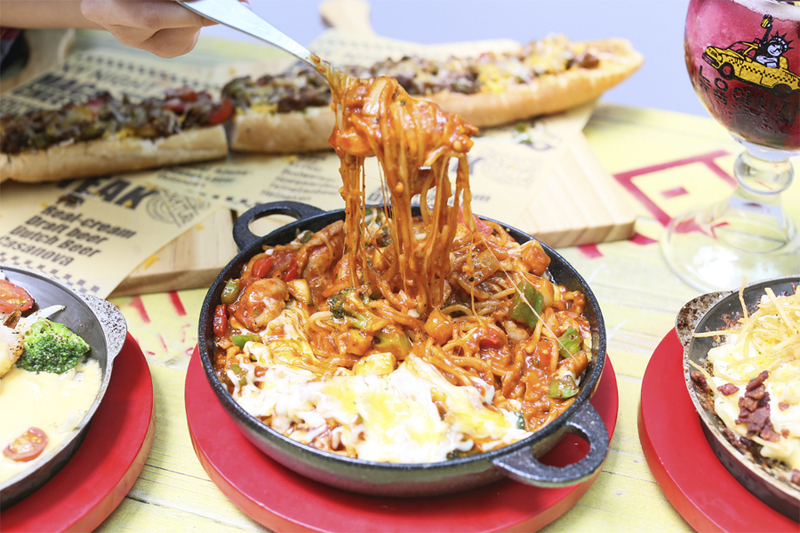 In terms of food, you can say it is a menu of popular Western comfort food from fried chicken, pastas, pizzas and stews, many with that unique Korean twist. 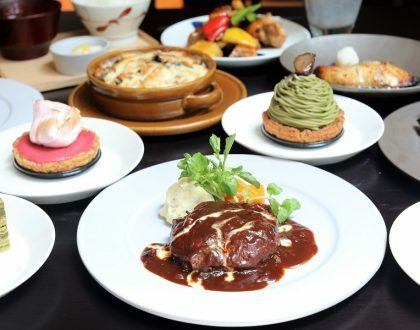 The recommended highlights include the 50cm Baguette ($13.90) loaded with bulgogi beef, shredded cheese and assorted vegetables, Cream the Curry ($13.90); topokki red curry topped with whipped cream, Finger Steak ($14.90) with homemade gorgonzola butter, and Waterfall Cheese Shrimp ($13.90) doused in cheese fondue on a sizzling hotplate. As you stir the cream in, you would find a mixture of beef and chewy topokki (Korean rice cakes) in thick red curry gravy. Surprisingly, that cream worked as it lightened the texture of the curry, and gave it that slight sweetness. Quite addictive. Countless possibilities here. 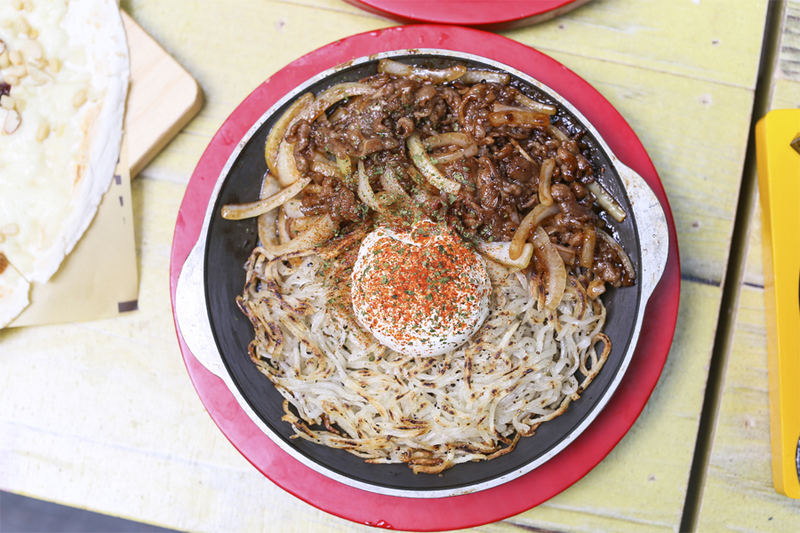 The Swiss breakfast dish of Rosti is given a Korean twist. The dish of shredded Russet potatoes was pan-fried till crisp and golden, added with sour cream and garlic. 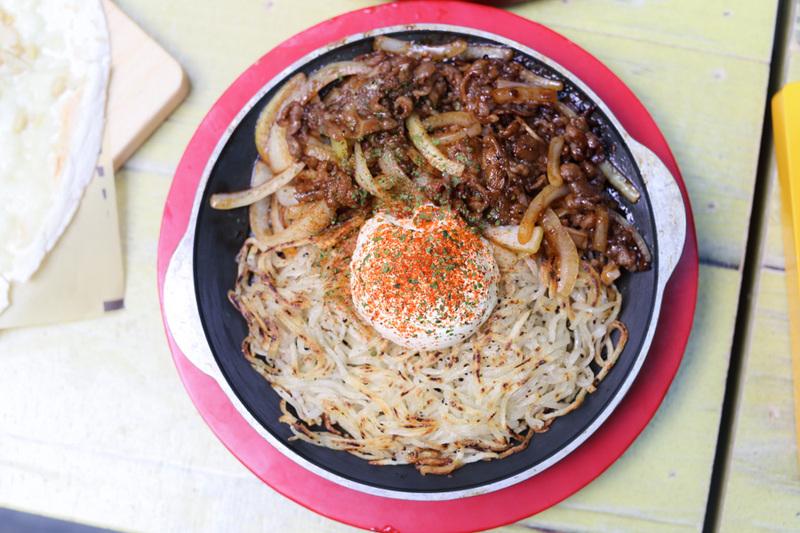 What make this special are the slices of Bulgogi Beef with onions – juicy, sweet, slightly salty and loaded with Korean flavour. Dakgalbi 닭갈비 or spicy stir-fried chicken, is a popular Korean dish cooked by stir-frying marinated diced chicken in a gochujang-based sauce. 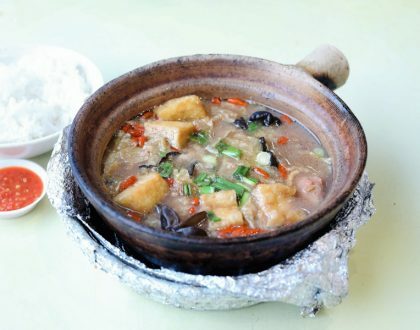 CNN calls this “South Korea’s most fascinating dish”. 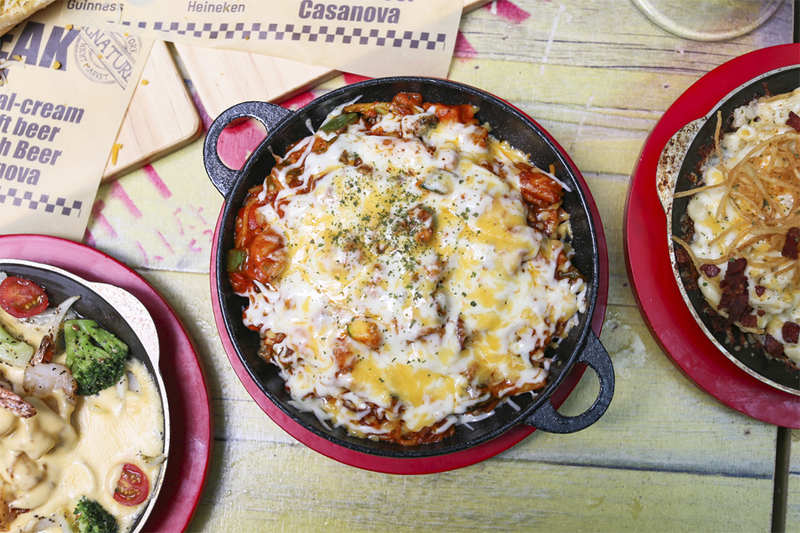 Having it cooked with pasta, blanketed in gooey melted mozzarella, is a wonderful idea. This is especially so if you like your spaghetti BOTH saucy and spicy. 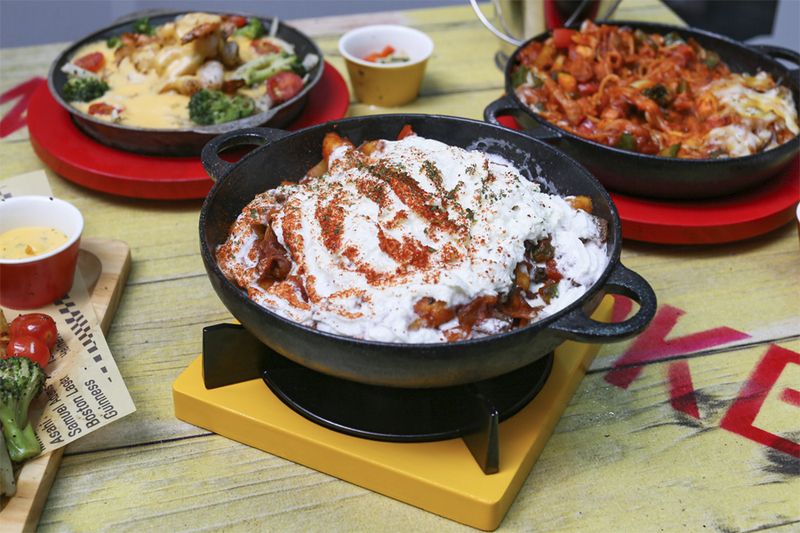 Beware of the spice level though if you have yet to experience Dakgalbi, as it would certainly set the tongue tingling. 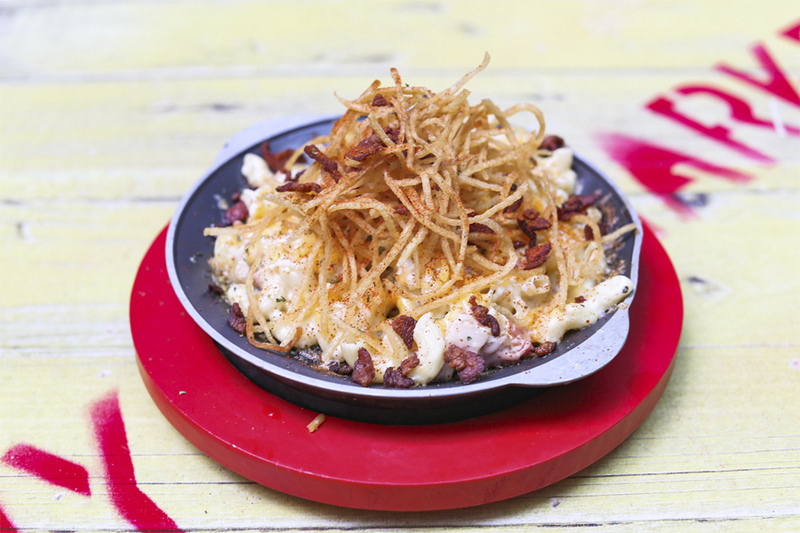 The class Mac & Cheese dish topped with strips of crispy deep-fried potato. My recommendation is to eat this while it is hot to experience that creamy melted cheese sauce. Should also be a kids’ favourite. Okay, this was one of the dishes I didn’t quite get. A show-stopper nevertheless. Also because the long-long Baguette almost filled up the length of the entire table. 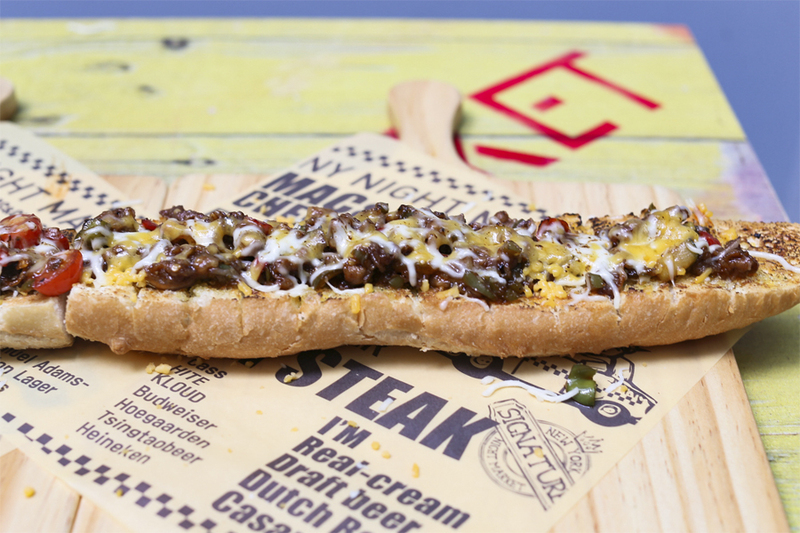 The toppings are similar to what would have been added to a ‘Korean pizza’ – BBQ marinated beef slices, jalapenos, cherry tomatoes, mozzarella, cheddar and onion salsa. Good for those who believe the longer, the better. 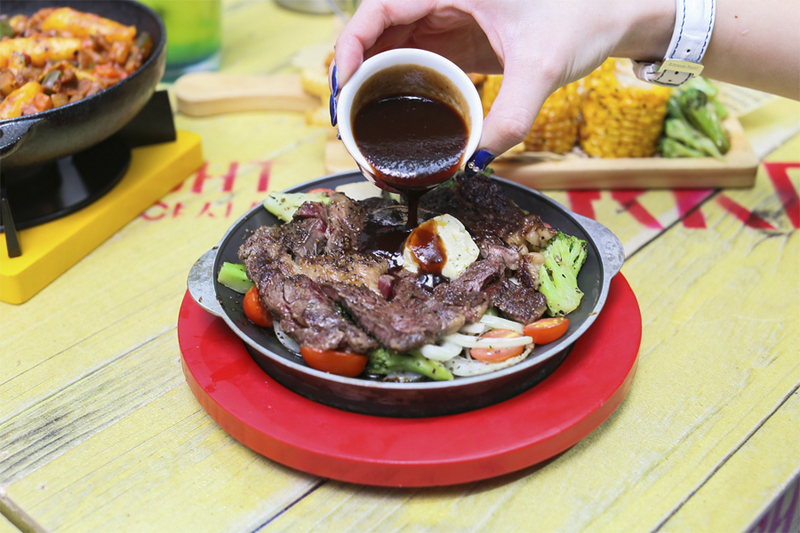 This steak is served sliced on a sizzling hotplate, for diners can cook it to their preferred doneness. 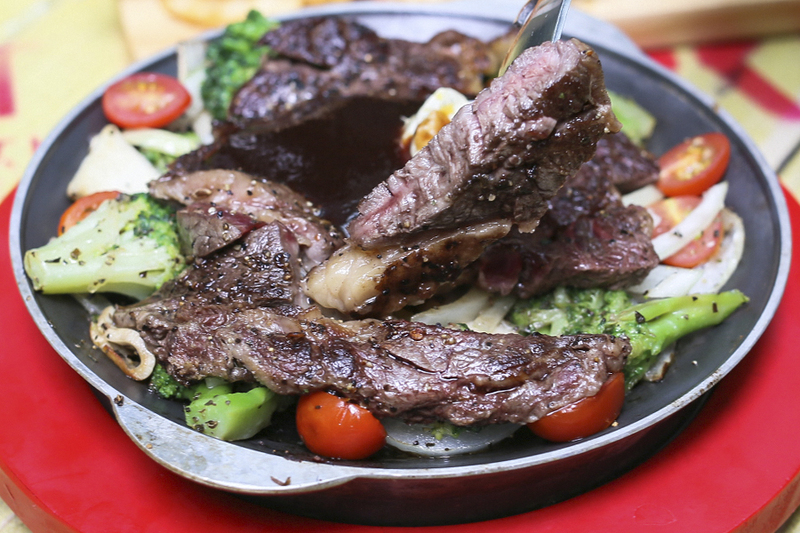 The 150g beef ribeye steak is also served with broccoli, sliced king oyster mushrooms, cherry tomatoes. 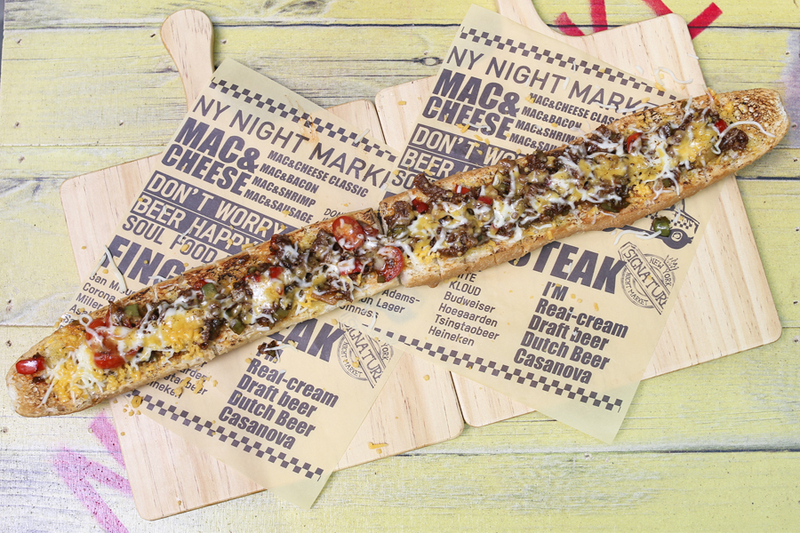 Those who order that “Party in New York” also get a full portion of NY Night Market’s signature Finger Steak. 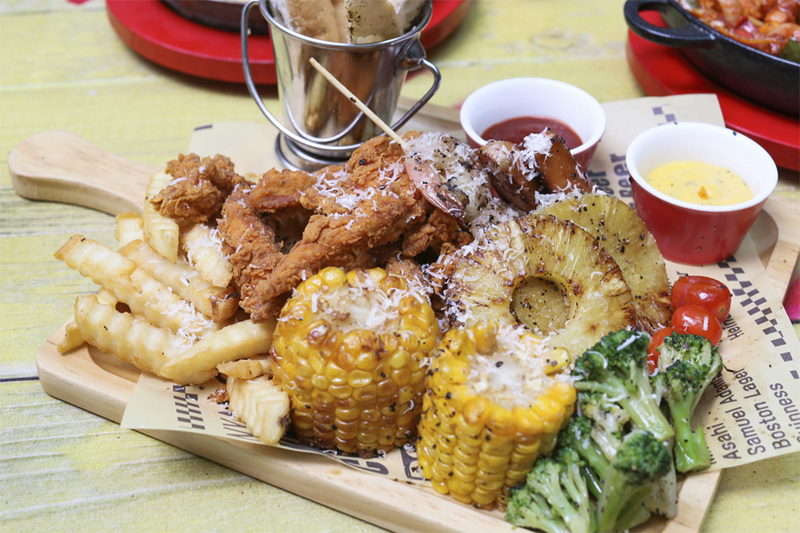 Consider this a Surf & Turf dish, with the other half made of a platter of grilled prawns, deep fried chicken tender, juicy sausage, pineapple, corn, crinkle-cut fries, and garlic breadsticks. 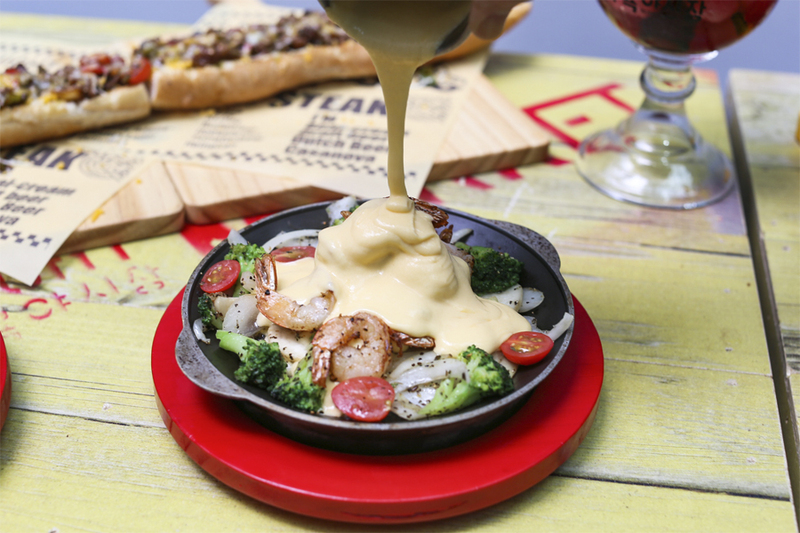 A hotplate dish of succulent sautéed shrimps, broccoli, king oyster mushrooms and cherry tomatoes… poured over with a mini bucket of cheese fondue sauce made of mozzarella and emmental. 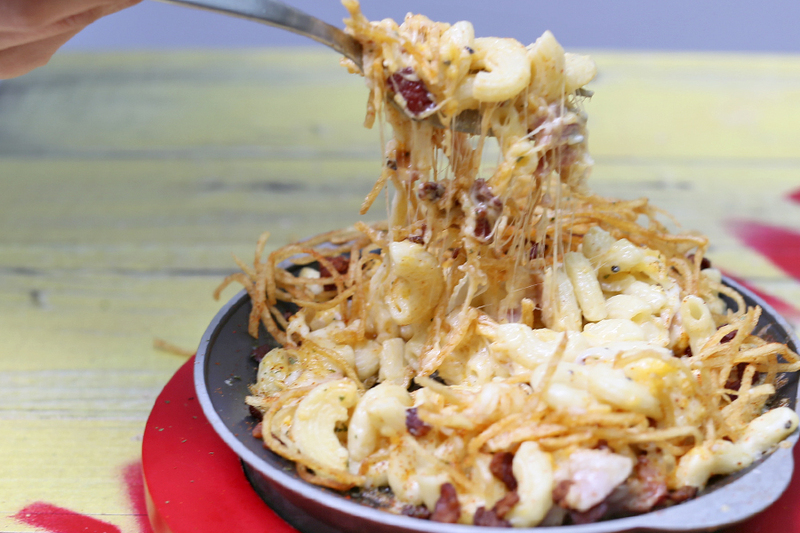 Super creamy, super cheesy. Yes, really. After being served a plethora of unexpected dishes, the Gorgonzola Pizza turned out to be more conventional. 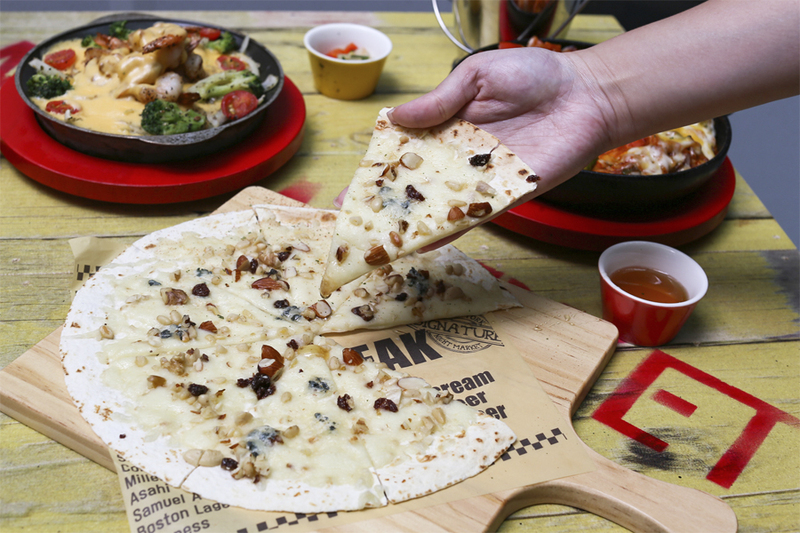 The base is of a thin tortilla base (reminds me of what I had over at Nipong Naepong at JEM), topped with gorgonzola blue cheese, mozzarella, cheese fondue sauce and crunchy mixed nuts. You are supposed to roll each slice up, and tip into the sweet honey. They call this the pizza with “the fixings of a cheese platter”. If you would like more savoury options, also available are the Pepperoni ($11.90) and Beef Leek ($14.90) pizzas. Drinks are also eclectic and diverse here. 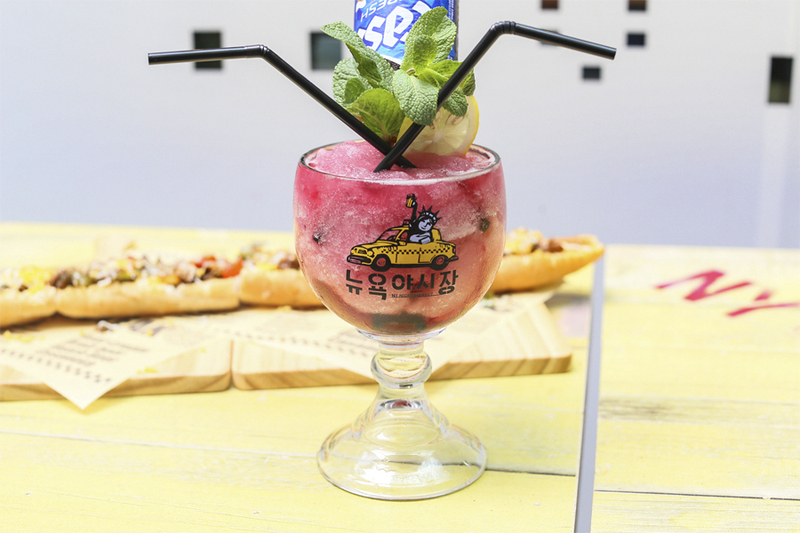 The recommended is the Blood & Seoul – a jumbo-sized cocktail of lime mojito mixed with strawberry and raspberry puree, lemon juice and an upside-down bottle of beer. As for the beers, you get them a couple of fascinating ones from the Cream Beer ($12.90); Day & Night ($12.90) which is included with black coffee; and Casanova ($13.90) mixed with Cointreau (orange liqueur). I generally do not go for the alcoholic drinks, and so would suggest the virgin Mojito ($6.90) and the popular Green Grape Smoothie ($8.90). 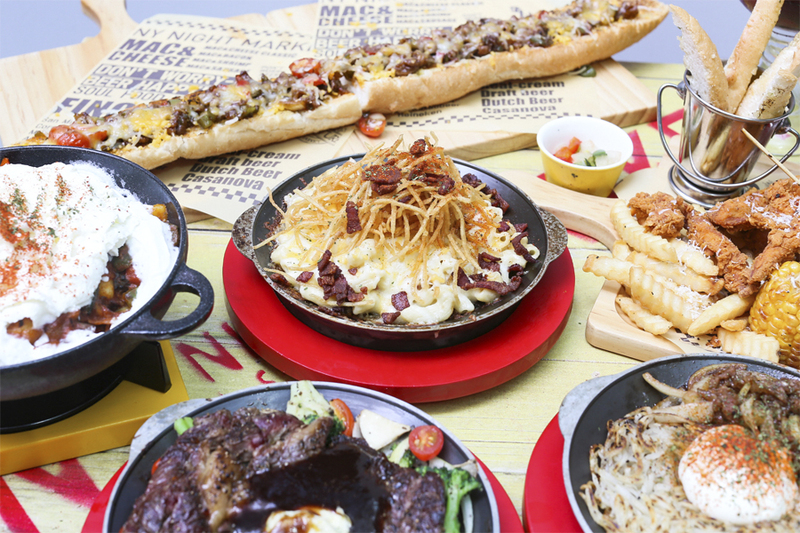 Get 10% OFF the total food bill at NY Night Market Westgate outlet, when you quote ”DanielFoodDiary” upon reservation or during ordering. • Minimum spending of $50 before GST and service charge. • This offer is valid from 15 December (Sat) till 28th December 2018 (Fri), at Westgate outlet. • This offer is not valid in conjunction with ongoing promotions, offers, discounts, and vouchers. * This entry is brought to you in partnership with NY Night Market.